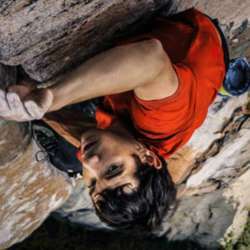 Alex Honnold’s Free Solo climb of Yosemite's El Capitan! You must be a member of the Malmoe Culture Group to attend this activity. Would you like to join this group? National Geographic's documentary Free Solo is made by the prize awarded E. Chai Vasarhelyi (documentary) and world known rock mountain climber and photographer Jimmy Chin. "Free Solo" is a bio-pick about Alex Honnold and his historic Protected content of Yosemite's El Capitan. As the movie opens, we see Alex in the later stage of that climb, and the images immediately will cause you to gasp. I just have to see this amazing breathtaking documentary. I hope you'll join me. I have bought my ticket, you buy tickets on their website. Hope to see you there. Read more information below. While the movie does well putting everything into the proper context, in particular, Alex's budding relationship with his new girlfriend, what makes this so remarkable is that we, the audience at large are shown how technical and challenging it is to climb up El Capitan, let alone doing it free solo. Alex does many trial runs to grasp and master the most difficult parts of the climb. The last half hour brings us the actual free solo climb (on June 3, Protected content , and even though we know the outcome (Alex lives! ), it is still stupefying and almost impossible to watch. There are simply no words for it. El Capitan: Protected content high, in Yosemite national park, USA. Free Solo is both a thrilling and inspiring portrait of an athlete who over rights our understanding of what a human being is capable of, physically and mentally.